I have needed to do this on a number of occasions and I am sure that you have too. 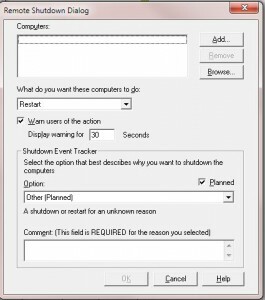 When you do this it will bring up a shutdown “interface” and this allows you, as you can see to the left to specify whether you want to reboot or not and how long until the reboot (I usually choose 0 anyway), the best part though is that you can choose a number of Windows computers to remotely reboot. 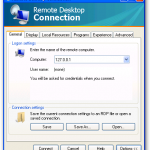 I was really surprised to find this so I tried to use this switch to remotely reboot computers from a Windows XP box but this option is not in Windows XP. This is a fantastic time saving tool. I am sure lots of people may say that rebooting external machines from a command line is easy enough but what if you want to delegate this to someone else? Or like me just forget all the time? The problem of course is that many of us are running Windows XP and do not have access to this new shutdown -i switch. I did get around Windows File Protection and tried to install the shutdown.exe app from Windows 7 into Windows XP so that I would have the Shutdown GUI but that did not work either. So just accept that you can only get this option to remotely reboot Windows desktops and Windows Servers from Windows 7.